Wow!!! This guy is a spammer 'banning' spammers . On the other hand, we're now only 17 posts away from 2000 replies in the SoV review! Who got reported? Kola? Or did the post you were talking about get deleted already? Exhibit A for why you should just report it and not notify the forum that you did so. If it gets reported more than once, so what? it is better than a series of posts after the deletion that no longer make any sense. Yes, I know I am contributing to it but I report stuff every time I see it. However, I never post saying I reported it......ever. It's okay post you reported if they start a new thread, right? It'll be deleted anyway. MegaSilver, returning to scheduled SoV business. Thanks, Ry. I posted once, realized how odd it looked and haven't since. Wise words. I love Gor'Vath's "anti-aura". Unfortunately, with it's minimum post-effect attack/defense roll, it raises order-of-operation issues with other bonuses and penalties that can't be cleanly resolved within the rules. For example, imagine Gor'Vath adjacent to an Arrow Grut that has height and is adjacent to two Swog Riders. If I were playing the Arrow Grut I could argue that you impose Gor'Vath's penalty first, leaving my attack at 1, to which I would then apply my height and Swog bonuses, giving the Grut a final attack of 4. Contrariwise, were I playing Gor'Vath, I could argue that you apply all bonuses first, raising the Grut's attack to 4, then Gor'Vath's penalty is applied, leaving the Grut with an attack of 2. Admittedly there is an official rule for handling unanswerable arguments like this-a d20 roll off-but it's a significant enough difference that I'm afraid it would result in a roll off everytime he's fielded. I vote NO to induct robbdaman's Gor'Vath into the Soldiers of Valhalla. The way I see it if you look at it thematically the arrow grut had the bonuses already because he was feeling all inspired and such and then Gor'Vath walks up and the stinking cloud rolls in shaking the grut's resolve and thus lowering its abilities.... but yeah maybe that's more of a house rule than anything. I'm really skeptical about the former interpretation having any weight or precedent. The way I look at it, its 1 + 3 - 2 = 1, not 1 - 2 = 1, then 1 + 3 = 4. You can't apply bonuses for a single attack at separate times--you have to do it all at once. With subtraction you can't apply them all at once-order of operations counts, which is why imposing a minimum the way it does creates a problem. And there is no precendent specifically for this situation. There is a "no rolling fewer than 0 dice" rule, but it's a general rule, and is therefore applied post-effects, allowing modification into the negative for dice rolls (Venocs attacked by Zelrig, or example). Intuitively, I agree with you guys, but mathematically and legally, the way Gor'Vath's written 1-2=1 is valid. 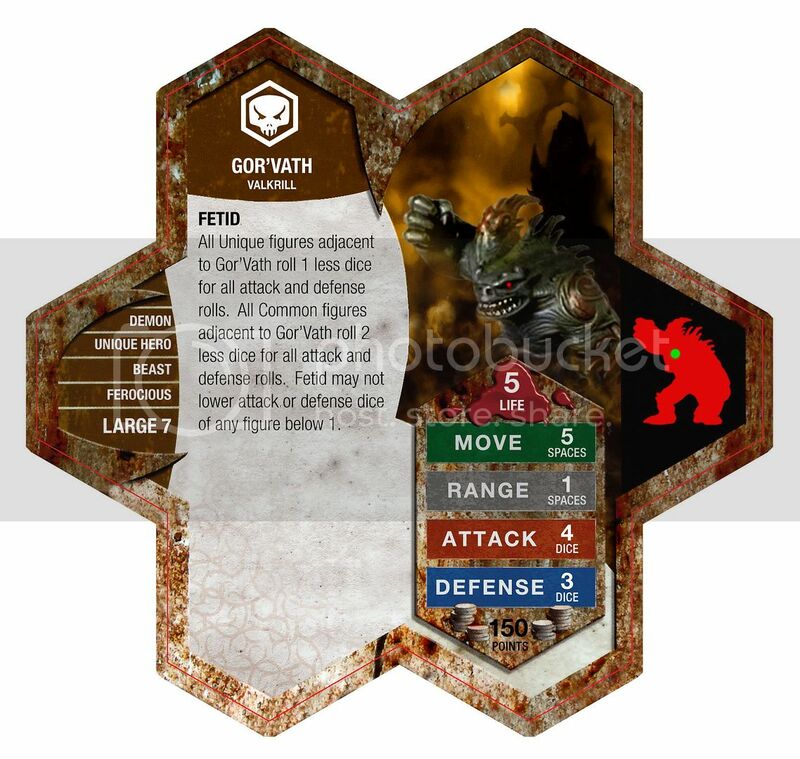 That's probably true, but then many figures would have an attack of 0 when engaged to Gor'Vath, which would probably require a reassessment of his price. I understand why a minimum was included, unfortunately it gums up the works quite a bit.